While the Australian tunnellers were trying to undermine the Germans, deep below the surface of the Western Front, the German tunnellers were trying to get to the Australians the same way. In Beneath Hill 60, the Germans play quite a prominent role, not just as evil shadows. We are fortunate to have some very talented German and German-speaking actors on board with us. Also, a special thanks to our German translation and language advisor, Verena von der Heiden. Marcus Costello (left) as Ernst Wagner with Kenneth Spiteri as Karl Babek in the German tunnels beneath Hill 60. Dennis Kreuseler as a German soldier. Marcus Costello as German Tunneller Ernst Wagner climbing a shaft. Karl Babek (Kenneth Spiteri) watches from below. Shoot Week 5 had some very exciting scenes! Our Stills Photographer, Wendy McDougall captured the action in the tunnels and trenches. Suffocating darkness. Brendan Cowell as Captain Oliver Woodward in the claustrophobic tunnels of the Western Front. The 1st Australian Tunnelers' rugby team prepares to take on the Royal Northumberland Fuiliers. The SFX team's smoke machine creates a wonderful atmosphere of foreboding. Brendan Cowell as Captain Oliver Woodward (left) and Anthony Hayes as Captain William McBride with a map of the underground tunnel system. Rain (courtesy of the Special Effects Deparment) in the trenches on the Western Front. Crawling away from the Red House (German Machine gun emplacement) before the explosion. Harrison Gilbertson as Tunneller Frank Tiffin. Tunneller Jim Sneddon (Alan Dukes) and his son Walter (Alex Thompson) wearing rescue equipment in the tunnels. We've taken a break from the dusty trenches and have moved the Shoot to the 'underground' tunnels - constructed above ground in a studio shed at Bohle. The Art Department, SFX, Lighting, Sound and Makeup teams have done an amazing job to create a very claustrophobic and suffocating atmosphere in the low, dripping, muddy tunnels. Jim Sneddon (Alan Dukes) and Walter Sneddon (Alex Thompson) clay-kicking to lengthen a tunnel. Photo by Stills Photographer, Wendy McDougall. Captain William McBride (Anthony Hayes) at his desk inside a dugout. Most of the tunnels beneath Hill 60 had names to help identify them. The Aussies named them after familiar places from home. Today's filming was in the 'Townsville' tunnel. Photo by Wendy McDgouall: Lead actor, Brendan Cowell, as Oliver Woodward. Young and terrified Sapper, Frank Tiffin (Harrison Gilbertson), in his bunker. Captain Oliver Woodward (Brendan Cowell) leads his team through the mud to take out a German machine gun nest. Sapper Norman Morris (Gyton Grantley). Sergeant Bill Fraser (Steve Le Marquand). Sapper Frank Tiffin (Harrison Gilbertson). Sapper Percy Marsden (Warwick Young). Billy Bacon, nicknamed "Streaky" for his lightening speed and agility. Played by Mark Coles Smith. Jim Sneddon (above) played by Alan Dukes and Walter Sneddon (below) played by Alex Thompson. The Sneddons were a real father-son team from Walsend in NSW who joined up together. Captain William McBride (Anthony Hayes). CREW PROFILE: Caroline Baum talks to on-set nurse, Bernadette Kersh. Bernadette Kersh tending to SFX Supervisor, Dan Oliver. Bernie Kersh prefers having nothing to do. s keeping a vigilant eye on the action, she hopes not to be called on. So far, she’s only had to attend to minor cuts as people hit their heads on the tunnels, un-used to how low they are... and she’s administering decongestants as people find it hard to breathe due to the amount of dust in the air. Fortunately all the serious wounds on set are fake, courtesy of the make up team. 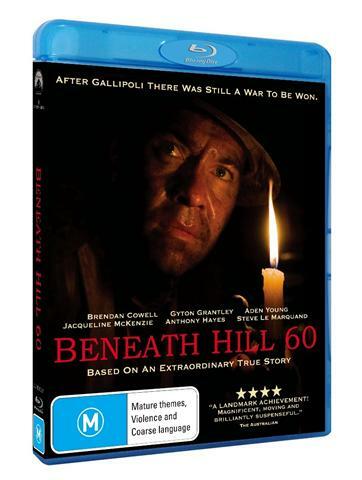 Beneath Hill 60 is Bernie’s first experience of being an on-set nurse. But she is used to dramatic real-life situations - as a nurse at Townsville General Hospital she’s looked after premature babies in the Intensive Care Unit and she’s also had extensive experience in the mines around the city, dealing with industrial accidents in high-risk situations. She dealt with severe crushing injuries, heart attacks and death with her usual down-to- earth calm and compassion. h education to work with underprivileged kids or NGOs like Medecins sans Frontieres. 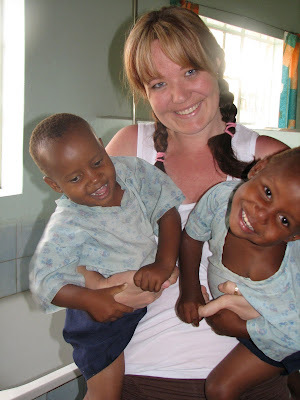 Bernie with orphaned twins, William and Willikista, in Kenya. 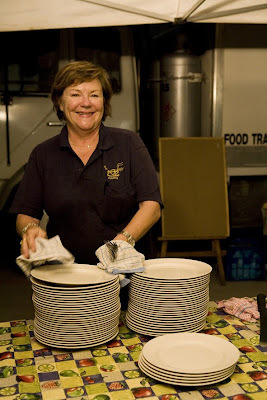 CREW PROFILE: Caroline Baum talks to Eric Fleury, in charge of on-set catering for the shoot in Townsville. My husband is getting fatter and fatter. ‘And what did you choose?’ I say, trying to sound casually disinterested instead of downright jealous . ‘Oh yes, there was bread and butter pudding with roasted pears’ (for which you can substitute Pavlova, macadamia nut pie and other wicked temptations served up with vanilla bean custard and ice cream on any given day). as well as the standard egg and fry up dishes. Nowhere are Napoleon’s words truer than on the set of Beneath Hill 60, where the prospect of a meal prepared by Eric, known as Cookie, keeps the morale of all troops, whether cast or crew, high. Born in Cherbourg, in north west France, he works out of Brisbane, where he also runs a wholesale meat business called Green and Gold. After time spent in the Caribbean working with Club Med resorts, he traveled to Mexico and Haiti, developing a repertoire of dishes from the world’s exotic cuisines and then set up two restaurants of his own in Brisbane- Cafe Galichet and Fleury’s - before going into the film catering business. He has provided on location catering for productions including Pacific, the Spielberg /Tom Hanks mini series on which cast the cast and crew of one thousand consumed up to 1.3 tonnes of meat a week, The Great Raid, House of Wax and Anaconda. 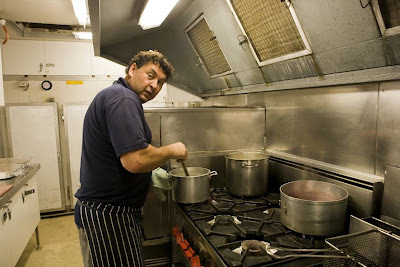 Eric prepares all the food for Hill 60 himself, preferring to work alone in his mobile kitchen with his wife Louise in charge of the buffet. He writes up a menu for each day, which always includes a couple of salads and a vegetarian option which was particularly appreciated by vegan cast member Bella Heathcote. He’s used to special dietary requests. The act of eating together at the start of the shoot is like a kind of unofficial communion, bringing everyone together to share sustenance before the arduous work begins. Each and every member of the production has probably given thanks at least once for not being on the dreadful rations that barely sustained the men at Ypres. But when you see the conditions they are working under, slogging it out in the middle of a chilly night wading through mud, they certainly look like they deserve that second helping of pud. Cookie stirring up a feast in the kitchen. His lovely wife, Louise, is in charge of the Buffet. Melt your butter slowly add your brown sugar stir it to the point to become creamy and lighter colour add your cream and cook slowly for a good half hour. Finish with a 2 tea spoon of corn flour . Peel your pears and cut them in chunky quarters, melt butter in pan, sauté the pears and add brown sugar. Sauté cook for a few minutes to the point that the sugar melt around the pears should take couple of minutes. Stay next to your fry pan, you do not want burn the sugar . Butter your slice of Raisin bread take your baking dish, pour some milk first at the bottom of your dish just to cover the bottom. Put your first layer of bread, add pears + chocolate, pour your mixture, add your next layer of bread, press the bread with your hand to make sure that the bread infuse all the egg mixture. Do the same process for 3 layers, cook for 40 minute in a 160 -170 c oven ( check with a knife if it’s cooked, the blade of your knife should be clean and hot if not let the dish cook for a few more minutes ) . When cooked, let rest the dessert for a 10 minutes. Sprinkle some icing sugar to the top served with your warm caramel sauce and if want to be naughty some lovely vanilla creamy ice cream and a lovely glass of champagne. The First Week of Shoot got the film off to a terrific start. All the Civilian scenes were shot in Week I - at the Waddell family Homestead, in the 'Burns Philp Office', at the Wedding Church and the scene at Alligator Creek. Next, we'll make the move to the tunnels and trenches and begin to recreate WWI ! Producer, Bill Leimbach getting into Costume as the Head of the Burns Philp Office. Adrienne "Ago" Ogle makes the finishing touches on props before the cameras roll. Chris Evans, 3rd AD takes charge at the Wedding Church. Chris directing the Extras at Burns Philp. The angelic Marjorie (Bella Heathcote) in her bridal gown with her newly-wed husband, Oliver Woodward (Brendan Cowell). Writer, David Roach getting into character as the 'disapproving man'. The 'Disapproving Man' gets back to his writing. Caro getting her wig on in the Makeup Truck. David and Caro are partners in 'Disapproval' according to their withering stares. Everyone from the Production Office wants to have at their 15 minutes of fame as an Extra. Here's Producer's Assistant Georgie getting her hair done in the Makeup Truck. Simon Ward from WIN TV interviewing our leading lady, Bella Heathcote. Art Department Assistant, Tania Leimbach making German tunnel maps in 'Fusselein's Bunker' - in the basement of Customs House.